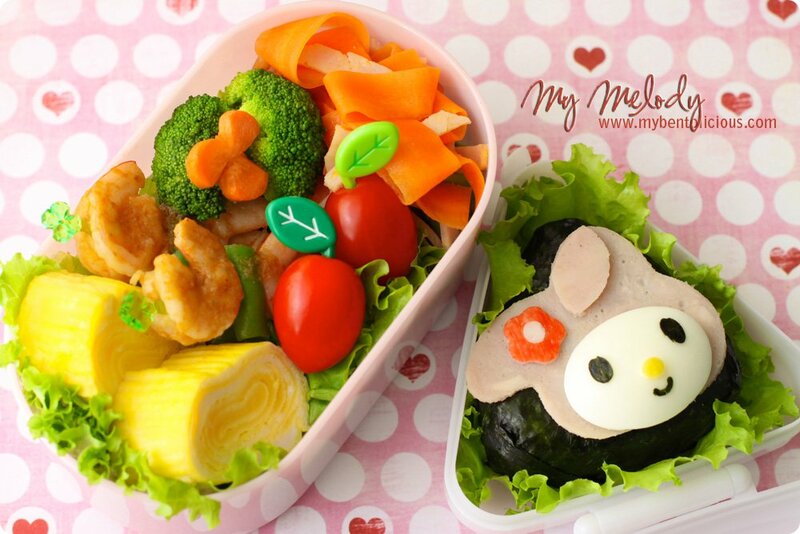 I start the new week with this My Melody bento. I got some of the new onigiri boxes at the Sanrio shop from my last trip to Singapore. I made one big onigiri and decorated with My Melody from ham, part of hard boiled egg, crab stick, nori and small part from tamagoyaki. This time I tried to divide the egg yolk and egg white for my tamagoyaki, mixed it in 2 different bowls. And I made the layer from egg yolk first and then egg white and ... egg yolk and so on repetitively. Inside the box : tamagoyaki, ginger-lemongrass prawns & green bean skewers, broccoli, grape tomatoes, and stir-fry carrot & ham. Tee hee.. you went to a Sanrio store too! 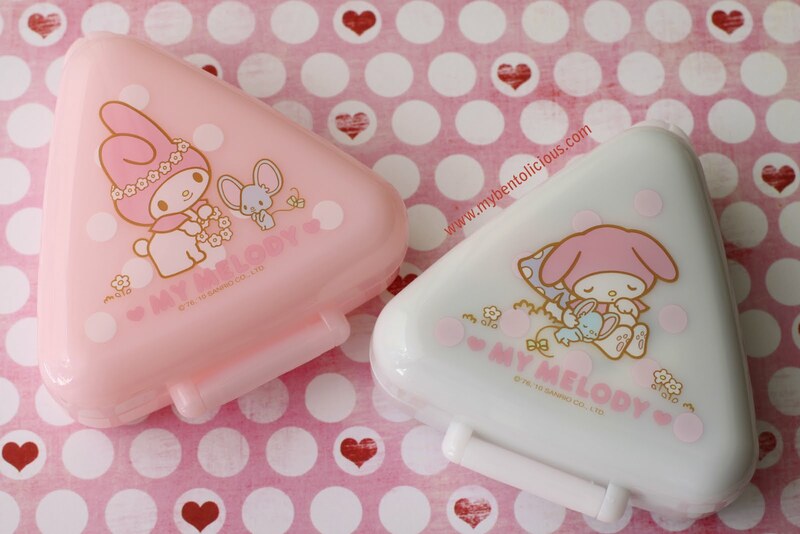 I love My Melody! So cute and your tamagoyaki is pefection! Like ur tomagoyaki too, nicely done! Cute little My Melody and I love your guest post too! The panda are so adorable. Looks like you had some nice finds in Singapore! Adore the pandas they are so cute!!! those new onigiri cases are adorable, and you've done MM justice with her cute egg face and sweet details. i love the heart background and absolutely PERFECT tamagoyaki, too. heading over to bentoboxUK for your guest post! Lovely, lovely post, Lia! The pandas really have my heart, and its great fun to see your adorable my melody set. 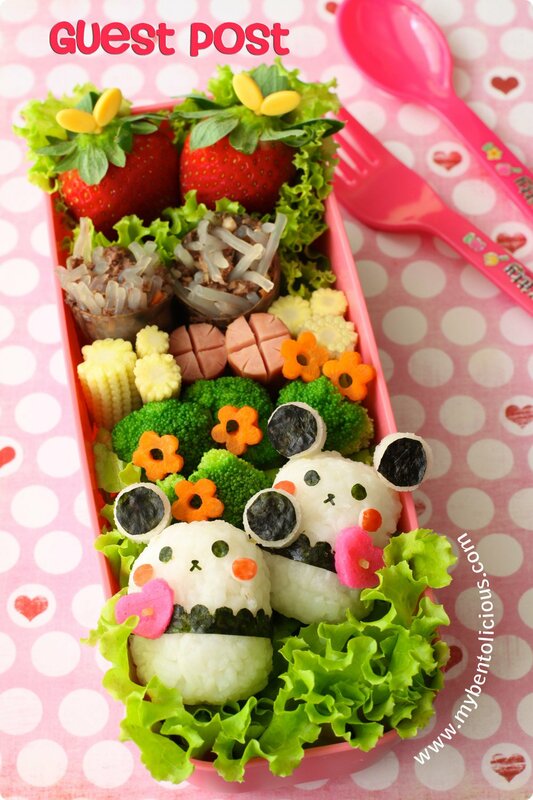 Truly, you light up each day you post a new bento with such disstinctive sweetness, its something I really look forward to! Wonderful bentos and they both are so beautifully put together. :D I love the bears and My Melody! 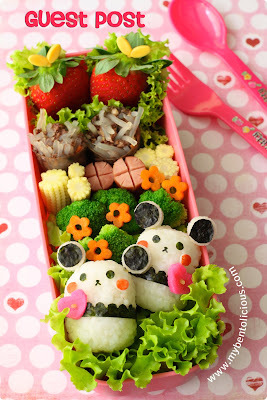 @bentobird : Hope I can keep making bento and share it with a sweet friend like you. Thanks a lot Jenn! My Melody is so adorable! You have done a wonderful job yet again :D The little onigiri boxes are so sweet!